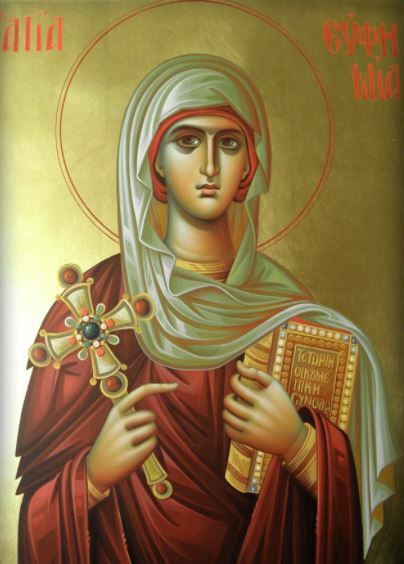 St. Euphemia the All-Praised is the patron of our theological academy. She was a pious, faithful Christian maiden who endured many tortures in her witness to Christ, interceded directly and personally at the 4th Ecumenical Council to proclaim the Truth of Jesus Christ, and was praised by Popes and Patriarchs as a defender and protector of the truth of the Orthodox Christian faith. She is an apt and glorious patroness, and protectress of our Academy. St. Euphemia lived in the 3rd century AD. She was the daughter of pious parents. Her father was a senator named Philophronos and her mother was Theodosia. She was born in Chalcedon, located across the Bosporus from the city of Byzantium (modern-day Istanbul). From her youth she dedicated her life to Christ and practiced the virtues of prayer, fasting and chastity. The governor of Chalcedon, Priscus, had made a decree that all of the inhabitants of the city take part in sacrifices to the pagan god Ares. Euphemia was discovered with other Christians who were hiding in a house and worshiping the Christian God, in defiance of the governor’s orders. Because of their refusal to sacrifice, they were tortured for a number of days, and then handed over to the Emperor for further torture. Euphemia, the youngest among them, was separated from her companions in the hope that she betray Christ if she was on her own. She was promised worldy riches but refused to deny Christ. She was subjected to particularly harsh torments, including the wheel, in hopes of breaking her spirit but the wheel miraculously stopped and an Angel of the Lord ministered to her wounds. The govenor then ordered that the saint be cast into a fiery furnace. Two soldiers, Victor and Sosthenes, led her to the furnace, but seeing to fearsome angels in the flames, refused to carry out the order of the governor and became believers in the God Whom Euphemia worshipped. Boldly confessing that they too were Christians, Victor and Sosthenes bravely went to suffering. They were cast into the arena to be eaten by wild beasts. During their martyrdom, they cried out for mercy to God, asking Him to receive them into the Heavenly Kingdom. A heavenly Voice answered their cries, and they entered into eternal life. The beasts, however, did not even touch their bodies. St. Euphemia, cast into the fire by other soldiers, remained unharmed. Ascribing this to sorcery, the governor gave orders to dig out a new pit, and filling it with knives, he had it covered over with earth and grass, so that the martyr would not notice the preparation for her execution but here too she remained unhurt. Finally, they sentenced her to be devoured by wild beasts at the circus. 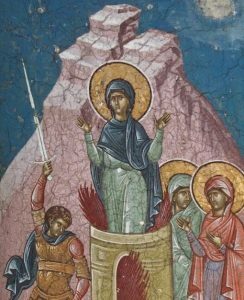 Before her martyrdom, St. Euphemia implored God to deem her worthy to suffer terribly for His Name but when she was cast into the arena, none of the wild beasts attacked her. Finally, one of the she-bears gave her a small wound on the leg, from which flowed the pure blood of the martyr, and immediately the holy GreatMartyr Euphemia gave her spirit to the Lord. During this time there was an earthquake, and both the guards and the spectators ran in terror, so that the parents of the saint were able to take up her body and reverently bury it not far from Chalcedon. A majestic church was afterwards built over the grave of the Great Martyr Euphemia. The Fourth Ecumenical Council convened in the city of Chalcedon in the year 451. The 630 delegates gathered in the church of Saint Euphemia where her holy relics were housed. The council repudiated the Eutychian doctrine of monophysitism, and set forth the Chalcedonian Creed, which describes the “full humanity and full divinity” of Jesus Christ, the Second Person of the Holy Trinity. Both the Monophysite and Orthodox parties were well-represented at the council, so the meetings were quite contentious, and no decisive consensus could be reached. The holy Patriarch Anatolius of Constantinople proposed that the Council submit the decision of the Church dispute to the Holy Spirit, through His undoubted bearer St. Euphemia the All-Praised. The Orthodox hierarchs and their opponents wrote down their confessions of faith on separate scrolls and sealed them with their seals. They opened the tomb of the saint and placed both scrolls upon her bosom. Then, in the presence of the emperor Marcian (450-457), the participants of the Council sealed the tomb, putting on it the imperial seal and setting a guard to watch over it for three days. During these days both sides imposed upon themselves strict fasting and prayer. After three days the patriarch and the emperor, in the presence of the Council, opened the tomb and found the scroll with the Orthodox confession was held by St Euphemia in her right hand, while the scroll of the heretics lay at her feet. St. Euphemia, as though alive, raised her hand and gave the scroll to the patriarch. As a result of this miracle, many of the heretics accepted the Orthodox confession, while those remaining obstinant in their heresy were consigned to the Council’s condemnation and excommunication.